I Didn’t Know Black People Did Yoga! In this essay, Jalisa shares her memories of some common stereotypes that we sometimes run into within the yoga community. Thankfully, many people don’t share the view of Jalisa’s co-worker! How blessed are we to be able to share our stories in an effort to educate those that do share his misguided assumptions? Enjoy! “You? You do yoga? I didn’t know black people did yoga.” laughed a bystander as I was expressing to a coworker my new-found hobby over a year ago. Now embarrassed, he began stumbling over his words, not wanting to be labeled as a “racist”. He looked around the office, I guess just now realizing that he was in a room full of women and men of color, and quietly turned back around to his computer to continue his work. Since then, I have encountered a few doubters and nay sayers but never once has that diverted me away from my personal goal – which is to maintain a healthy lifestyle while sharing my passion for yoga. 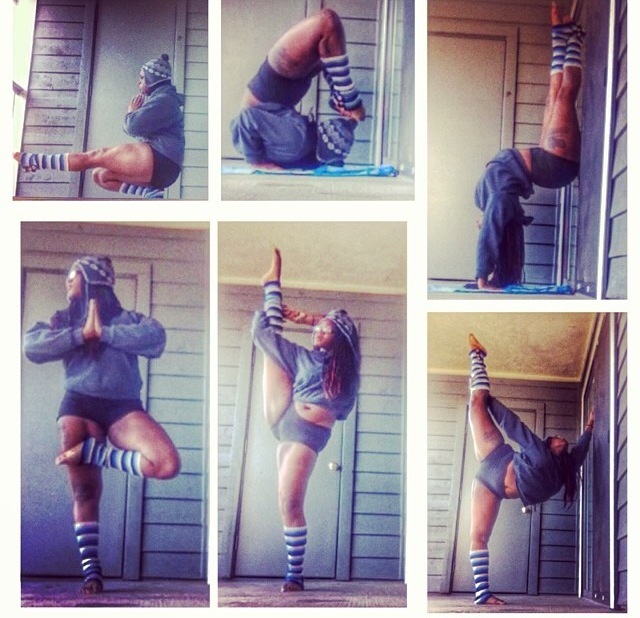 Showing women that you don’t have to be stick thin to practice yoga. A very common stereotype in the area that I’m in. Now exactly one year later, I’m still deepening my practice and feeling better than ever. I’ve lost almost 15 lbs, dropped 3 dress sizes and am developing more strength and flexibily every time I hit the mat. I’ve shared my practice with one of my best friends who is now practicing on a regular basis and is a constant partner, participating with me in acroyoga. Currently, I am connecting with members in the Nashville area to provide an outreach for beginner yogis of color. Members of all races are welcome, but from what I’ve been hearing there alot of people that are to intimated to attended a class because they are the only person of color in the whole room. My goal is to organize a workshop for members of all races to come out and enjoy meeting fellow yogis and start them on the path of developing a daily practice of their own. Follow Jalisa to find out more about her quest! Valerie is inspiring people all over the world with her fierce, no-excuses approach to Yoga and LIFE. She is a beautiful example of the fact that anyone can practice and benefit from yoga. 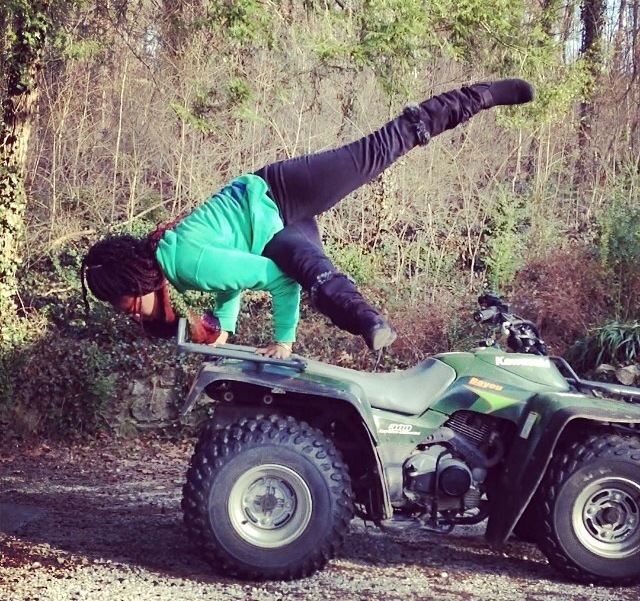 This yogini has created a social media storm by sharing her Big Gal Yoga Practice and we couldn’t be more thrilled! My first yoga teacher was an older man named Lawrence Caughlin. I had no fear of learning yoga from a person who was a man, skinny, or older. I understand that some people feel like they need to be taught by someone who looks like them (for example a bigger woman), which is completely fine and great, but I just want to make sure that people don’t feel like that they have to be scared or intimidated by learning yoga from someone who doesn’t look like them. I started yoga by taking a Hatha Yoga class at my university which met for 2 days out of the week for about 2 hours. We practiced the Sun Salutations 3-4 times and then had a Hatha Yoga sequence. When I started yoga it was pretty casual. I’d wanted to try it a handful of years before but had forgotten about it. It wasn’t until my friend was taking a class at our university, that I was reminded to try. At the time, I didn’t think that it would eventually snowball into something bigger than me. I’m from California and am located in the Bay Area. From time to time I’ll practice yoga at a studio, but I mainly practice at home, a studio space, or out with nature. I’m an out doorsy kind of gal and yoga has given me the push to pursue the things that I enjoy – the things that are connected to nature. Not just looking at nature but finding ways to interact with it. It’s important for me to point out that you do not have to already be strong or flexible to start yoga! If you are already strong or flexible that is just a plus because you will probably be able to progress quicker than some people. For the average person, like myself, it will take time to gain both strength and flexibility. I have been practicing yoga for about 3 years, and am still learning new things about my body. Have patience in your practice. I like to try out as many different types of yoga, but some of my favorite types of yoga to practice at a studio are Yin, Qi Flow, Anusara, Prana Flow, and Vinyasa. When I am at home, I usually practice a couple rounds of Sun Salutations, stretches, poses for yoga challenges, and then practice poses that I am personally working on improving. The Sun Salutations are where it all starts. This yoga sequence is the base to all of the other types of yoga. It helps you gain strength and flexibility. I like this Sun Salutation video by Ekhart Yoga. This may seem a bit intimidating to beginners, but always remember you can do modifications of all poses till you feel comfortable doing the full pose. There is also a great video by Body Positive Yoga that has modifications for bigger women that might help some people out. You don’t have to look perfect in the pose to feel the benefit of the pose, take your time. My favorite pose is Mermaid Pose. In general I just like mermaids! Conveniently I already really liked doing pigeon pose which helped a lot when practicing Mermaid pose. I mainly use Tumblr to share information about Big Gal Yoga. This tumblr is a way for me to “talk to myself”, and maybe others about my updates and other motivations along my journey to weight loss through mostly yoga, swimming, and some hiking, climbing, and traveling. 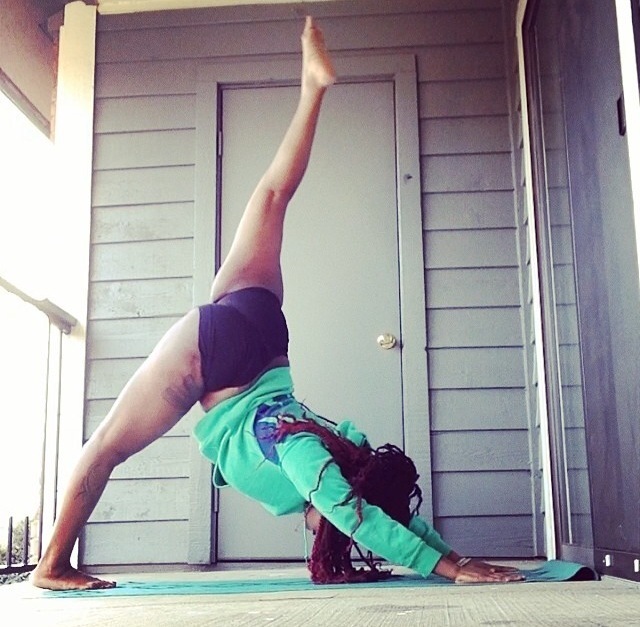 I started Big Gal Yoga as motivation solely for myself. Yoga has given me this special feeling that I can’t describe. Yoga helps people to find balance and confidence within themselves. Follow Valerie on her wonderful journey!